It’s often a fine line whether drivers should try to fix mechanical problems themselves. Directhaul makes drivers spend a lot of time in the workshop to give them a thorough understanding of a truck. You might expect that slackness in daily checks would not be an issue for dirt road runners in the outback, where help is a lot longer than an hour away if something goes wrong. But not so. Spud Murphy is national fleet manager for Darwin-based dangerous goods specialist Directhaul. "It’s a challenge for all of us to educate the new school driver because the old school is going out as we all know, as operators and those skill bases are going and the care factor is going," Murphy says. "A lot of the older school guys, their trucks are fitted out with toolboxes and stuff; the new school guy turns up with his lunch box, and he’s expecting to go on a 10-day trip just with his lunch box. They’ve got no idea at all. "So it’s a pretty big challenge for us to mould and educate and up-skill these guys." Murphy says the company has training modules through the year, toolbox meetings and drivers spend a lot of time in the workshop. "Some guys don’t even know how to back a brake off or stuff like that, so it’s a bit of a worry," he says. "Unfortunately we don’t have a lot of skill base to choose from because a lot of guys have been doing metro work and they come to road train work and it’s a completely different kettle of fish for them." Murphy was speaking as a panellist during the ‘Training staff to do daily checks’ session at the most recent Technical and Maintenance Conference (TMC) in Melbourne. 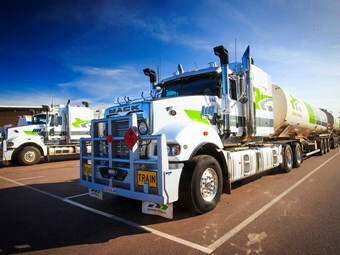 The TMC is put on by the Australian Trucking Association, Australian Road Transport Suppliers Association and Paccar. Lance Fisher from Sydney-based operator John L Pierce spoke from the floor about the risk of "driver overload" when it comes to pre-trip plans and the like. Fisher added it can be a fine line between what a driver and a qualified mechanic should be expected to do, for example when it comes to occupational health and safety. Session chair Chris Blanchard supported that "fine line" dilemma, saying there are a lot of situations where you don’t want drivers without precise mechanical knowledge underneath vehicles. "How many fleets here do not carry spare tyres anymore? There’s quite a few, and we’re actually the same," Blanchard says, referring to Herb Blanchard Haulage based at Grafton in NSW. "We had a major injury to a driver with a runaway vehicle because of a ride height problem on a trailer that was not rectified, causing the bags to roll over and crease. "He got under the vehicle with the brakes off, lifted it up, and had a rollaway. The bloke was very lucky not to be killed." Jodie Broadbent, who has since left her role as the head of Road Freight NSW, says the industry has to spend more time training. "All the job adverts say ‘I want experienced drivers’. We need to start investing back into training drivers and the things we want them to do," she says. "If you just want them to be steerers, train them to be steerers. If you want them to have a better mechanical knowledge, make sure you are doing that sort of training. "As soon as you get rid of them because they’re no good, they just become someone else’s problem…And they’re driving towards you, and that’s even worse." You can read the full story in the February issue of Owner//Driver magazine.